Read this about Ganjam a small village but unique in some respects with a glorious past tradition in jewelry and fig fruit. The village is in the outskirts of Srirangapatna town but for all practical purposes is a part of the town. Ganjam has one temple with a powerful Devi idol and had a French connection. 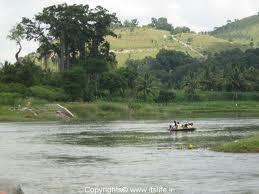 Ganjam is a small old village in the outskirts of Srirangapatna town in Srirangapatna Taluk. Though it is not known much to the people outside and even in many parts of the State it had a fame and reputation as a village of artisans in jewelry. Ganjam was once the jewelry making center of Karnataka like Surat of Gujarat. It was famous for delicate and intricate ornaments. Due to the introduction of mechanization and automation in the jewelry industry, the Ganjam village lost out in its glorious tradition in this field to the modernization. Now the only connection may the name of some of the jewelry shops with the name Ganjam attached to them. The village was also known for the special Ganjam Fig fruits. The horticulturists here used to grow a special and very popular variety of fig known as Ganjam fig (Ganjam anjura) fruit. Now due to the cash crops taking over the available land, like the sugar cane the fig cultivation has lost out the race. Now Ganjam people can only have a nostalgia about these two unique fields of activities of the villagers. Ganjam village is famous for a temple. The temple of Nimishamba, Nimisha means a minute and amba means Devi. 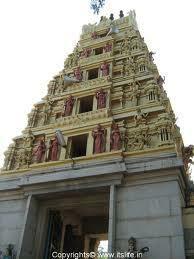 The temple is very famous throughout Karnataka and in many ears of the Southern States. The belief is that the goddess grants the wish of the devotee in a minute because of which the name of Nimishamba was bestowed on her by her loving devotees. The goddess is Parvathy the consort o f Lord Siva. There is a Sri Chakra (discuss) also in the sanctum. The idol of the Devi and the Sri Chakra are carved out of black stones. Next to this temple is another shrine. This shrine is dedicated to Lord Moukthikeswara, the Lord Siva. The Nimishamba temple was built by the Mysore Maharaja Mummadi Krishnaraja Wodeyar about 400 years back. Devotees from far and near come here to worship the Devi and get her blessings. Most of also spend some time near the river. Devotees offer lemon and garland made out of lemons the goddess. Few of the lemons are returned to the devotees after keeping near the Devi in the pooja room. The devotees carry the lemons so received and keep them in their pooja room/place at home and worship for few days. After few days the lemons will be immersed in wells or ponds or river. Another offering to the Devi is sarees by devotees. Devotees flock on Fridays, Varamahalakshmi festival and Durgashtami during the Navarathri to offer prayers. The local people sell fresh vegetables on the bank of the river near the temple. Special darsan tickets are available for Rs 10/- for quick darsan. The temple is on the bank of one branch of River Cauvery in Ganjam. On the other side of the river on a hill, Karigatta hill is another temple the temple of Lord Narasimha. This temple is about 3 km from Srirangapatna. One more specialty of Ganjam Village is that it has a French connection. There was a French missionary by name Abbe J.A. Dubois or Jean-Antoine Dubois or Abbe Dubois here for about 20 years. Since Abbe was following local traditions, he was a very popular missionary. He was fond of the local staple food raagi mudde (raagi is a millet and mudde is ball). The cooked raagi is made into balls which are to be made into small pieces and along with a side dish gulp down as food. He used to wear the local dress of Kachche Panche (traditional dhoti dress). He also used to work with the farmers in the fields. Abbe left France at the beginning of the French Revolution in 1792 when he was 27 years old to India to take up the missionary work here. He came to the then Madras (now Chennai). From there he was sent to Pondicherry churches. The then Governor of Mysore which covers Srirangapatna area also, requested Abbe Dubois to come to Srirangapatna and accordingly he came here. He worked here from 1800 to 1823 to resurrect the Christian community who were shattered by Tippu Sultan. He found it to be very difficult. During his tenure Dubois built a famous but a small church here the St. Mary's Basilica and a primary school too. The school was in a dilapidated condition which was recently demolished. Near to the church there is an old structure. The locals inform that the structure was the residence of Abbe. Dubois introduced the small pox vaccination for the first time in the princely State of Mysore. He compiled an essay known as Hindu Manners, Customs and Ceremonies. The book is in 3 parts. One deals with the caste driven society. The 2nd par is on Varnasrama (the 4 fold division of society on the basis of duties)and the 3rd portion is on Religion--feasts, temples, objects of worship. The book was in French written based on his discussions, interactions and observations during his missionary at Ganjam, Mysore and Bangalore. He adapted the culture of locals and was like a sanyasi. Abbe abjured meat for years. He was welcome among local people of all castes and conditions. Dubois was a Dodda Swamiyoru for the people of the then Karnataka and the then MADRAS province. Abbe had learnt all the south Indian and Sanskrit languages. He left India to his place France in January, 1823. Ganjam is 2 km from Srirangapatna, 17 km from Mysore and 127 km from Bengaluru. Buses and trains are plying from Bengaluru and Mysore to Srirangapatna and autos or taxis are available at Srirangapatna for local travel. Accommodation is available in Srirangapatna and Mysore.